Chemical Compounds are Key to Health. – Consists of CB1 & CB2 receptors. Cannabidiol (CBD) binds to a G-coupled protein, TRPV-1, which influences inflammation, pain perception and body temperature. Multiple NIH studies show that CBD inhibits FAAH activity, which is responsible for the deterioration of N-arachidonoylethanolamine, commonly known as anandamide. CBD also inhibits anandamide reuptake. The scientists who discovered and isolated the neurotransmitter anandamide discovered that it contributes to elevated mood. Unfortunately, endogenous anandamide levels are very low, and the half-life is rapid. CBD plays an important role by inhibiting anandamide degradation and enhancing endogenous levels. 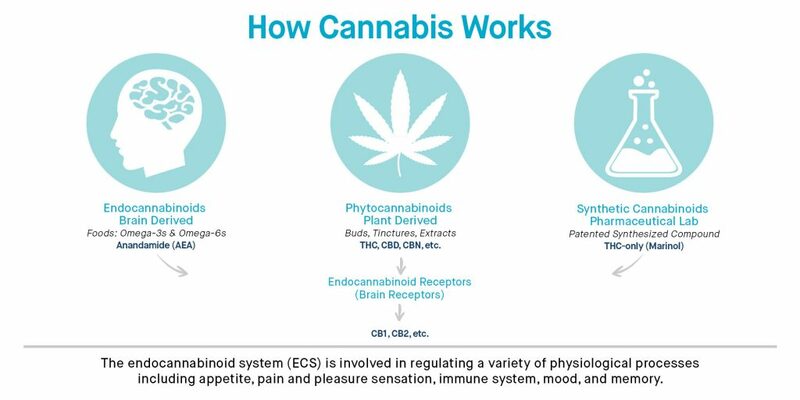 CBG and CBC, other cannabinoids present in Harpers Gold, also increase anandamide levels. Unlike THC, CBD and other cannabinoids are not psychoactive. Early studies show that even at extremely high doses, CBD remained psycho-tropically inactive. The immunomodulation of cannabinoids has been investigated in human studies to evaluate safety in immunocompromised patients. Evidence supports safety, though there is evidence that CB1 agonists, such as THC, may be maladaptive in liver fibrosis. Harpers Gold products contain less than .3% THC. There are no published reports of CBD induced serotonin syndrome, but patients on SSRIs should be cautioned. In vitro and animal studies on CBD and CBN were not associated with negative outcomes.